Welcome to Bagge and Son your Alignment, Suspension and Brake Specialist serving Culver City, Santa Monica and Beverly Hills Since 1918. 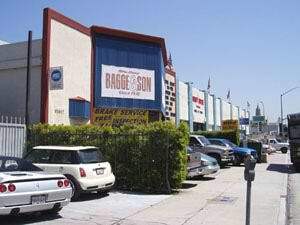 Bagge and Son has been Serving Culver City, Santa Monica, and Beverly Hills Since 1918. Tom Vardon has over 40 years experience and Paul has over 32 years of experience. 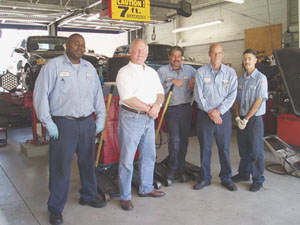 All of our technicians are ASE Certified. We are equipped with the latest Alignment tools, to work on your Classic, Truck, 4x4, or Car. Working on any brand of vehicle, Mercedes, Jaguar, Dodge, Chevrolet, Ford, BMW, Toyota and much more. Does your vehicle ride to rough or maybe a little bouncy? We can install new suspension so that you can have the right comfortable ride. We here at Bagge and Son give only the best of quality and service to our customers, why take the risk of being up sold on a brake system you may not need. Corporate enterprises need to meet numbers, we only want to make sure that you are in a safe vehicle. We don't need to meet any numbers or quotas, we only repair what you approve and what you need. We are members of the ASC, You deserve the best and we only give the best. We also perform services for over 50 local repair facilities and body shops. They put their trust in us to perform only the best in quality, You can too!. Copyright © Bagge and Son 2001-2012 All Logos®, Trademarks™ and Copyrights© are property of their respective owners. All car pictures displayed are for the sole purpose of depicting the type car the shop specializes on and they were obtained from public domain. ● Labor Max Discount $100.00 ● Not valid with any other discounts that are already given. ● Coupon must be presented at the time the work order is created to be valid, no exceptions. ● Cannot be combined with any other coupons or offers.